I spoke about my accident on Mt. McKinley, but also brought my story up to date with images from Nepal, the Alps and Kyrgyzstan. My story is an ever evolving adventure which has been going on for almost 20 years and has no thought of stopping yet. 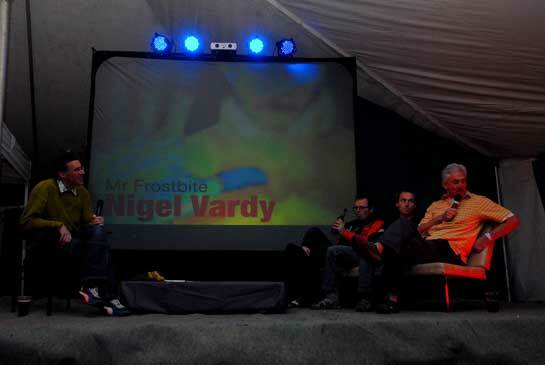 I thoroughly loved the event, fielding questions from Niall with comment from Andy. We worked well together and thoughts are to take the format onto the road. I couldn’t stay for the weekend, but awoke to a cold and frosty morning in my VW Camper Van. The sun was shining and everyone was going to have a great time. I’m already looking forward to the 2012 event..! Next Next post: Where did I put that Camera..?